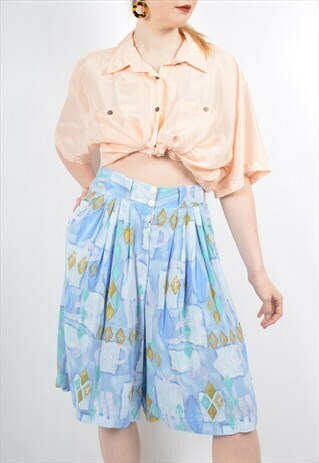 This Salvaged garment is a 100% vintage 80s high waisted light fabric culotte style shorts in light blue, green and gold geometric pattern with pleated front detailing. Pockets at sides and belt loops. Slightly elasticated waistband for flexible fit. CONDITION - Excellent vintage reworked condition, may be some natural signs of wear due to age. SIZE - Model is a size 8 and 5'6". Garment size 8-12. Waist 27"-31" 69cm-79cm / Length 24" 61cm. DELIVERY - Next day delivery available Monday-Thursday on orders made before 1pm. Orders made on Friday will be posted on Monday. Model is a size 8 and 5'6". Garment size 8-12. Waist 27"-31" 69cm-79cm / Length 24" 61cm.